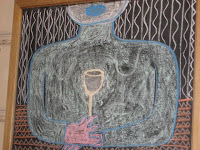 A while back, we were in a wine bar mood. Just some talk, a light bite, and a bottle. V had been to Vinárna Bokovka a number of times and wanted to show it to me. It was founded by the members of a wine club who were inspired by the 2004 movie "Sideways." It is on a side street, not far from the National Theater. Do not expect anything fancy. In fact, expect something with a hint of semi-finished American basement, circa 1974. 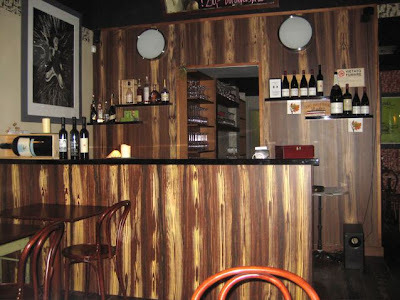 Fans of imitation wood paneling and uncomfortable chairs will feel right at home. There weren't many tables, but almost all were taken. We were lucky to walk in and get one. Like the other patrons, we came for an evening of wine and conversation, not interior decorating inspiration. 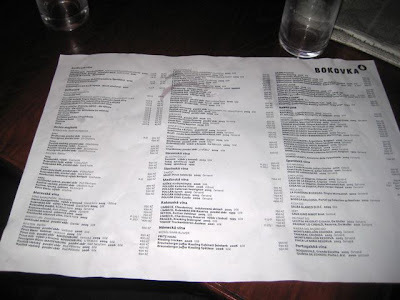 There was an extensive wine list, covering two sides of a large paper sheet. The focus was on European labels, with plenty of Moravian wines. I've drunk my share of Moravian whites and been to many cellars. I must confess I've never loved a Moravian red. 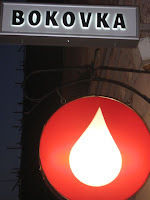 Bokovka offered Burgundys (790-1990 CZK), Bordeaux (690-2290 CZK), Spanish (290-1490 CZK, Aregentinian (590-2590 CZK), Italian (290-1290 CZK) and much more. When we were there, the weather was warmer. 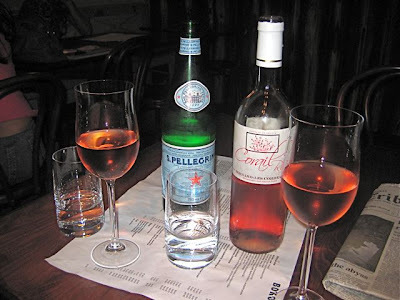 And one of our favorite warm weather drinks is a nice, chilled rosé. I can't give you the exact price. But I can tell you that it was light, very refreshing, not too sweet, and not too expensive. 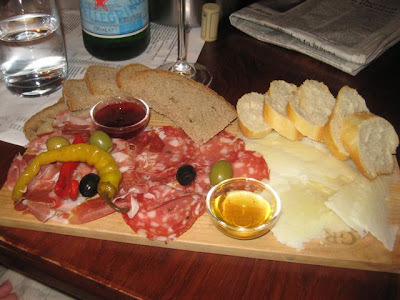 We were both hungry, so we ordered one of their Tuscan cutting board specials (98 CZK). It was a a good quantity of prosciutto, salami, olives, pecorino, pepperoncini, and honey and berries in syrup. Baguette slices and Czech bread sat on the edges. A sweet (and salty) deal. Don't expect to eat a full meal. There were only snacks with nuts, sliced meats, and cheese. Vinárna Bokovka is not a touristy spot or place you'd go to for chic ambiance. However, it is the kind of place a woman might bring a man after he'd proven himself worthy of more than just dinner. Apropos of nothing, that first photo sent me back with a bit of a shock -- check out the cover of David Bowie's 'Ziggy Stardust' and see what I mean. Thanks for the great work. I read it via RSS, which means the traffic is probably invisible to you, but I never miss a post. Hmmm.. interesting. Perhaps there was something subliminal going on with me. A flashback, of sorts.. I read almost all your posts. This one made me smile.Good job. 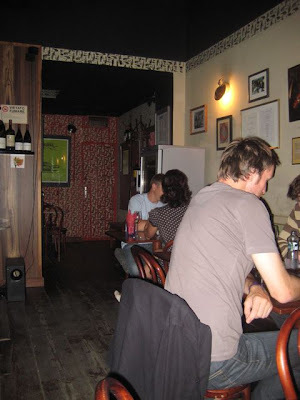 You don't do the place justice likening it to a "semi-finished basement circa whatever." 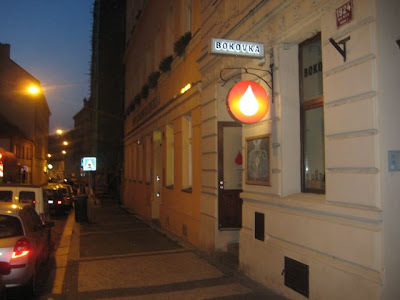 Bokovka is cozy, tasteful and artistic. Add in the non-smoking policy and the tasty "talir" action and I'm there often for birthdays and such with groups of friends. The place is a shining island in a lake of greasy pubs.